Metformin is the most commonly prescribed diabetes medicine in the world, with more than 61 million prescriptions filled in 2012 in the United States alone. In addition to its blood-sugar-lowering ability, the drug has been linked with a variety of other potential health benefits, including decreasing the risk of death in people with Type 2 diabetes, lowering cancer risk, and increasing life span. Now, new research suggests that it may also reduce the risk of the eye disease open-angle glaucoma in people with diabetes. 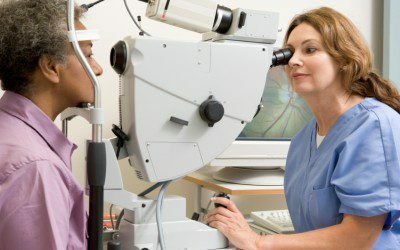 Glaucoma is the leading cause of blindness in the United States and the world, affecting more than 3 million Americans. The most common form, open-angle glaucoma, affects 2.7 million Americans over age 40 and occurs when the eye’s drainage canals become blocked, leading to an increase in eye pressure and damage to the optic nerve. Drugs that mimic the effects of calorie restriction such as metformin are known to decrease the risk for a variety of age-related conditions. To determine whether the medicine is also beneficial for reducing the risk of open-angle glaucoma, for which age is a major factor, researchers looked at data spanning 2001 through 2010 from a U.S. managed care network. Of the 150,016 study participants with diabetes, 5,893 (3.9%), developed open-angle glaucoma. Over the study period, 60,124 people (40.1%) filled at least one prescription for metformin, 46,505 (31%) filled at least one prescription for a sulfonylurea, 35,707 (23.8%) filled at least one prescription for a thiazolidinedioine, 33,948 (22.6%) filled at least one prescription for insulin, and 3,663 (2.4%) filled at least one prescription for a meglitinide. The researchers found that people prescribed the highest amount of metformin (more than 1,110 grams in two years) had a 25% decreased risk of developing open-angle glaucoma compared to those who were prescribed no metformin. Each 1-gram increase in metformin was linked with a 0.16% reduction in the risk of open-angle glaucoma, meaning that taking a typical dose of 2 grams of metformin daily for two years would decrease the risk by 20.8%. “The findings are intriguing, though it is still too early to recommend that diabetics be given higher doses of metformin based on the study,” noted Pradeep Ramulu, MD, PhD, in an interview with Reuters. “Our hope is that if we can confirm the findings in diabetics, who clearly benefit from metformin for their diabetes, additional studies can be performed among persons without diabetes,” said senior study author Julia Richards, PhD. Because the study was not a randomized controlled trial (the gold standard for producing dependable evidence, in which one group is randomly assigned to receive the study treatment, then compared to a group that received no treatment), the authors note that the findings cannot prove that metformin prevents glaucoma. For more information, read the article “Metformin use associated with reduced risk of developing open-angle glaucoma” or see the study’s abstract in the journal JAMA Ophthalmology. And for more information about metformin, see “Metformin: The Unauthorized Biography,” by diabetes educator Wil Dubois. If you use an insulin pump to control your diabetes, then you won’t want to miss the upcoming “Second Insulin Pumpers Retreat.” Bookmark DiabetesSelfManagement.com and tune in tomorrow to learn more.